Can Social Media Help Major League Baseball Get Younger? Major League Baseball has an age problem. The 147-year-old league is financially healthy, sure, but younger fans are increasingly hard to find. MLB has the oldest median TV audience at 56 years, compared to 49 for NFL viewers and 41 for NBA fans, according to Nielsen. But with a cadre of young stars eager to leave their mark on the game, baseball hopes to bring millennials back to the diamond. 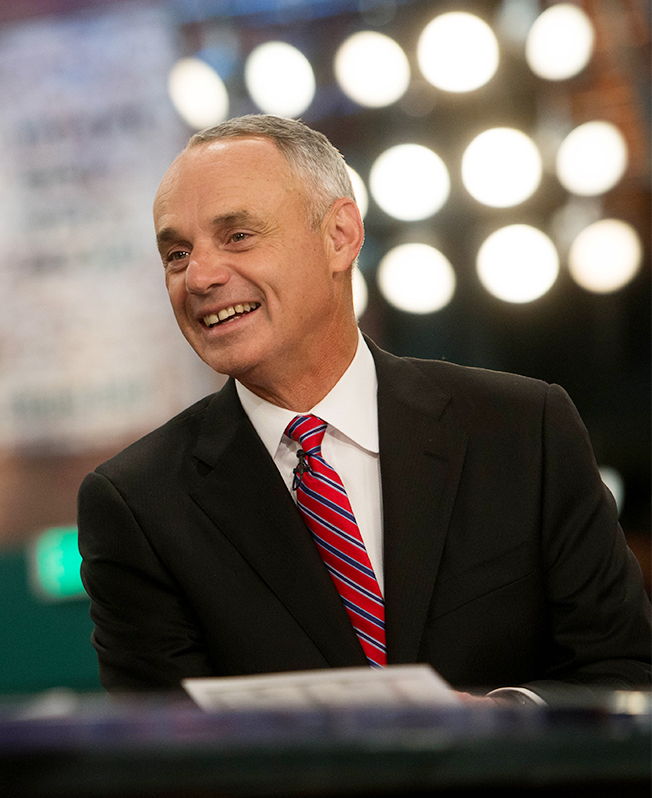 As Rob Manfred begins his second season as commissioner, he's looking to increase the league's social footprint while appealing to those who don't watch sports on traditional TV. Adweek: What do you make of Bryce Harper's comments about how the sport is "tired" and should embrace players showing more emotion in an effort to appeal to a younger audience?Rob Manfred: There's a couple of word choices there I would have preferred that Bryce not have made. Having said that, the general sentiment is that this great young generation of stars that is emerging in the game is going to play the game their way—not a bad thing. Every institution evolves over time, and the fact that the players who played in the 1960s played the game one way doesn't necessarily mean that players who are playing in 2016 are going to play it exactly the same way. I think younger stars taking control of the game is good in terms of marketing it to younger people. Do you think baseball should embrace this and have more moments like José Bautista's bat flip during last year's playoffs? I don't see that as a baseball commissioner's office-driven issue. The players play the game on the field the way they play the game. That's the point I was trying to make about Bryce's comments. There's these great young players coming along; they're going to decide what's acceptable on the field. Along with Harper, you have this new generation of stars including Matt Harvey, Kris Bryant and Mike Trout. How are you going about marketing these guys? A significant push is engagement in social media. We had a really interesting day with Snapchat Day [on March 11]. We actually suspended our rules on electronic devices in order to give the players an opportunity to get out there and show fans a little bit more about what their days are like. We think those sorts of undertakings are crucial to having these young stars reach out and connect with young fans. Speaking of social, what else are you looking to do this season that's going to help bring in those younger fans? We're going to have a season-long initiative with Snapchat. We'll have somewhere between 15-20 [Snapchat Stories] over the course of the season. We are definitely looking to broaden our footprint [and] increase the number of platforms—Twitter, Instagram, Snapchat—where baseball has a really big presence. As someone who is a big partner with the current TV ecosystem, how much are you paying attention to cord-cutting? My own view is that cord-cutting is a significant phenomenon. The cable ecosystem is going to survive; there will be erosion as a result of cord-cutting. And we think, because we were kind of at the forefront of over-the-top delivery of baseball programming through MLB Advanced Media, we're as well-positioned as any sport to deal with it. You've made in-market streaming of local games a big goal. Where are you at with that? We have long-form agreements with Fox. We are in what I hope are the final stages of discussions with Comcast to pick up their RSNs. We hope to have something done with them by Opening Day (April 3). We are also in conversations with DirecTV for the Root RSNs, as well as the few independents that we have. Ideally, I'd like to have everybody done by Opening Day. Time's getting short, but we're going to get everybody done. Do you see companies like Facebook, Google and Amazon as future rights partners? We do. I think there will be aggregators of live sports content going forward. It might be some of those companies. It might be MLB AM. We've already taken a step down that road in our deal with the NHL, and we're very interested in that strategy. MLB recently held its first game in Cuba in 17 years. With the ongoing efforts between Cuba and the U.S., how much opportunity is there in that market? Realistically, from an economic perspective, it's a long-term opportunity. I think as the economy develops, there will be an opportunity for baseball. Right now, we see the trip to Cuba as an opportunity to participate in the changing of the nature of the relationship between Cuba and the U.S. We have our own issues with respect to that relationship. Most particularly, the immigration process—how players have to come and go.